1958? Museo del Prado: Velazquez: "Esopo." Apparently with a "First Day of Emission" postmark from March 24, 1959 cancelling a 1.80 Ptas stamp picturing the upper section of this portrait in green. Printed in Spain. Ediciones Artisticas, Madrid. $5 from Laurentiu Cruceanu, Bacau, Romania, through eBay, August, '02. 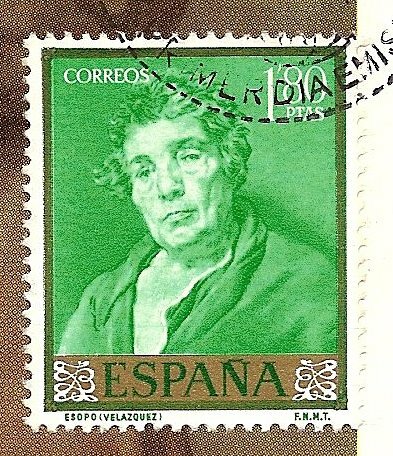 I had not known that there is a Spanish stamp commemorating Aesop. If anything, the green stamp is clearer in its detail than is the colored reproduction of the painting. Click on the stamp to see a larger illustration of it. I will keep this card with the stamps and other post office materials.